Good. 014025448X ALL BOOKS SHIPPED WITHIN 1 DAY OF PURCHASE! The Mitford book series reads very well. Jan Karon writes so, as you're reading, you feel as if you know the characters. Great for all ages. I share these books with my great Aunt in NC, and she has been passing them along to her niece in SC. So, many people are being able to share the joy of the series. Excellent book. All of the characters are so real to everyday life. Would recommend it to friends, which I already have. 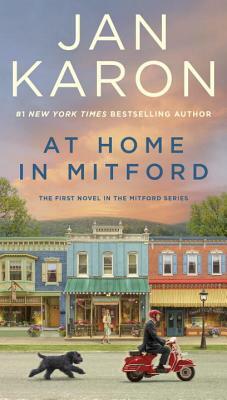 Jan Karon creates the home town we would love to live in now. Filled with real characters - the ones we recognize and the ones we laugh about being related to - we get to know and love them through the eyes of a middle-aged bachelor who just happens to be an Anglican priest. Father Tim is devoted, caring, set in his ways and not quite sure what to do with his creative, lovely new neighbor. This is the first in a series of nine about Father Tim and all the Mitford family. The author lets us watch as the years go by and while we may know what's likely to happen next, we still really want to go there. You will not go wrong with any book by Jan Karon. They are all wonderful, uplifting books. I would certainly suggest starting at the very first and reading them in series. I would also suggest buying them because they are books you want to keep in your library to reread and to loan to friends and family. The characters become so real to you that they become like family. Jan has a way of pulling you into the story. When I first read these books, my husband was not a minister but he has become a minister in our later life and I find many similarities of our life now in these books.